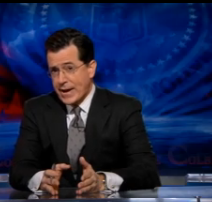 Stephen Colbert played lifecoach to the talking heads in the 24 hour news cycle last night on the Colbert Report. The big story of the day? You guessed it. “Sarah Palin’s reaction to the media’s reaction to her reaction to the media’s criticism of her rhetoric in the wake of the Tucson shootings.” Still with us? “I know you think that she has nothing to offer the national dialogue, and that her speeches are just coded talking points mixed in with words picked at random from a thesaurus.” Zing! Check out the clip below if you aren’t suffering yet from Palin Fatigue. If only to hear Colbert’s thoughts on KardASShian implants.